The ants are already active in the yard after such a mild winter. 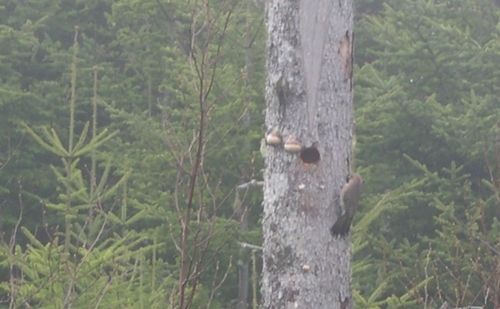 So, I’m glad to see that a couple of Northern flickers have made a nest nearby. They are the ants’ worst enemy. Flickers may not be easy to spot in the morning mist, but their calls to one another are strong and lively. They’ve been working on their nest in an old tree for the past week. I’ve also spotted them looking for ants in the lawn. These migrating members of the woodpecker family have an unusually long and raspy tongue, not unlike that of an anteater. After digging holes in the ground with their sharp beaks, they use this sticky tongue to gather numerous ants, pupae and eggs quickly and efficiently. Ants and other insects are the flickers’ primary food. 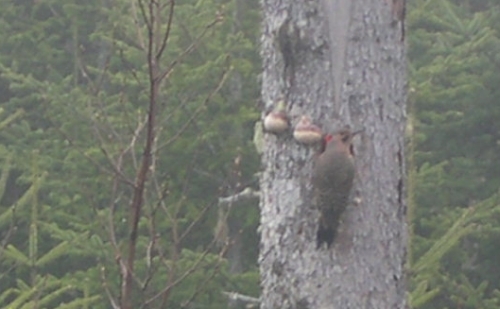 Flickers make their nests in old trees, also known as snags. After a 3 inch diameter hole is made, a large cavity about 15 inches deep is created by both parents. Six to eight eggs are also incubated by the pair. At this point, the cavity is still being excavated as I frequently see the birds flinging wood chips out of the hole. Although they are known to re-use old cavities, this nest is a new one, and there’s much work to be done to create such a deep nesting hole. The fungus seen growing next to the hole in these photos was removed by them yesterday afternoon. They’re busy all day long, and the harder they work, the more ants they eat. Imagine how many ants this entire family will consume over the summer months! Woodpeckers in general seem to be very handy at getting rid of ants. Of course, sometimes they must destroy a retaining wall in order to do that . . . 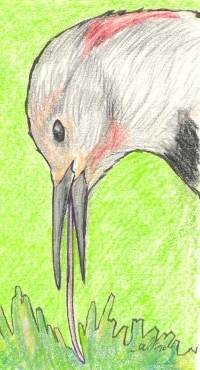 Your post sent me to my bird guide, and to a likely identification of some feathers. Oh dear. I want a flying anteater in my garden too, Amy. They look very pretty – and are soooo useful! We often have ant colonies living in our house and garden; they particularly like making a nest on the lower edge of the steel window frames by hollowing out the bricks beneath. It’s a rather disturbing thought. So a Northern flicker would be most welcome. Do they *have* to dig holes in trees, though? Or can they make a less… er… tree-damaging nest too? The first colorful, exciting bird I identified with my little Golden Guide when in about 5th grade, the flicker has always had a special place in my heart. I wonder, do they eat those nasty Florida fire ants, too? We have these guys here in abundance! They – like all woodpeckers – like to sound off any interesting surface, like a chimney or gutter or side of the house. I enjoy the calls of Flickers all around my home each day. Almost like they are laughing but not sharing the joke with us humans. Like your illustration of the tongue. Wow. Didn’t know they had tongues like that. I’m gonna keep an eye out for them. I wasn’t sure what to expect when I saw the title in my feed LOL I took some photos of a Northern Flicker within the last two weeks as well. My father in law has some return every year to rear their family. They have been working hard too. I love this posting and I LOVE it that they removed the fungus. That is a wonderful bit of housekeeping they’re doing. Aren’t you lucky to have them setting up housekeeping in your yard? Right now I have a mama Anna’s hummingbird tending two babies in a nest right by my studio. I feel blessed too, but I spend too much time worrying about them! Hi Sharon, I thought it was pretty cool that they had removed the fungus too. They sure worked for a long time making that nest just right for their family. I’ve never seen a hummingbird nest, though I sometimes see the birds flitting past. It’s difficult to not get attached to birds you’ve watched so closely over a season. I have just identified this bird in my back garden (Hammonds Plains) this afternoon, I have seen it several times on the hummingbird feeder !!! S, I have read a few accounts of flickers’ visits to hummingbird feeders. Strange but true! Their long tongues would certainly allow them to lap up the liquid. Glad you were able to identify the flickers in your garden. Perhaps there’s an old tree nearby where they’ve hollowed out a nest. I have a few pictures of it on the Hummingbird feeder, as I was so surprised to see another type of bird on it. .Hopefully I may find where they are nesting, but certainly enjoying watching them.